January 19th, 2016. The latest issue of V Jump magazine features Shoutmon and Gumdramon of Digimon Xros Wars and Young Hunters fame as available partners in the upcoming Digimon World -next 0rder-, which will be their first appearance in a Digimon game that exists outside the confines of the Xros Wars universe. The Xros Wars Digimon were previously featured in the game's Jump Festa trailer, which along with the announcement that Frontier's Spirit Digimon would be in the game, came as a surprise to many. The second page of the spread maps out the Village of Beginnings, matching the description seen in 4Gamer. The Village of Beginnings is divided into six districts, which are (counterclockwise from the left) the Different Dimension District (異次元区), the Introductory District (渡来区), the Central District (中央区), the Pleasure District (娯楽区), the Commerce District (商業区) and the Research District (研究区). 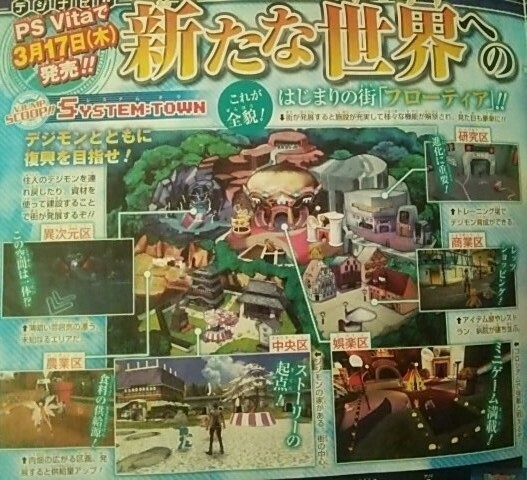 Jijimon's house is in the Central District, while the Pleasure District contains a Coliseum for battling Digimon, among other attractions. The Commerce District houses the shops that tamers can buy items from, and the Research District is where training facilities for powering up Digimon are located. As the player ventures through the Digital World, recruiting Digimon and gathering materials to improve the town, it will gradually develop into a booming city. Last month's issue of V Jump revealed the game's launch date, the new character Tsuzuki Shouma, and that Susanoomon would be joining the roster. that town is look BIG! can i ask? when we have a clear image of this scan? when v jump release in JP? Usually we don't get clear scans unless a dedicated scan group decides to scan it for whatever reason. The street date of this issue is the 21st, but Japan is 14 hours ahead so it's already the 20th over there. I'm curious to how the Spirit and Xros Digimon are going to work level wise. This is very exciting for a Digimon game, and I'm for sure going to aim to get Gumdramon. 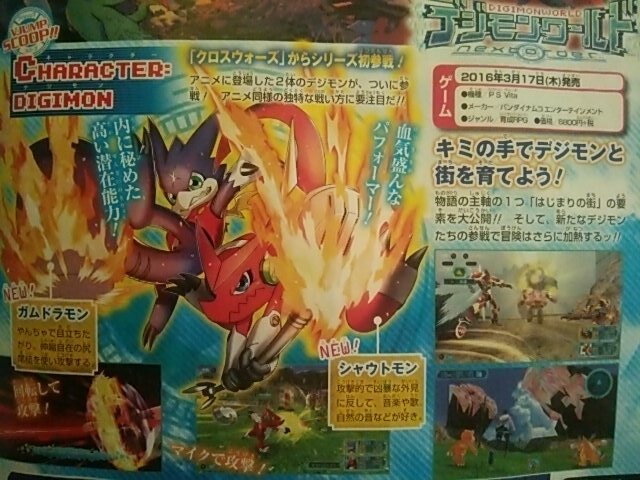 Hopefully their evolutions are included, or if there is a xross system with the whole exe thing or jogress.